The Chinese giant salamander is the world’s largest amphibian species. It was discovered in the year 1871 and was categorised as species belonging to Cryptobranchidae family and was scientifically named as Andrias davidianus. And it has been in the top second position among the 4000 endangered amphibian species. 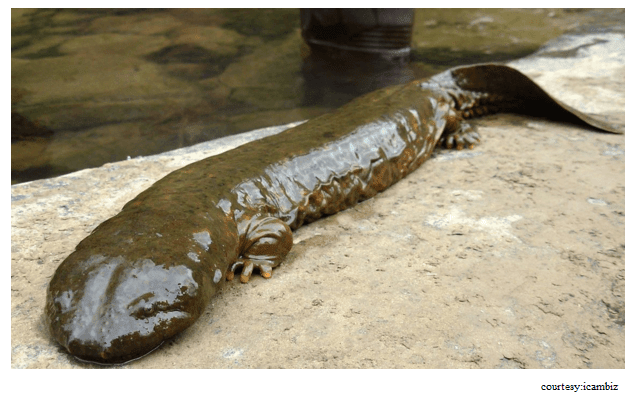 The Chinese giant salamander was found in rivers of China. They are usually sighted on the rocks and water surface of their habitat. Human greedy activities is the main reason for the endangerment of this species. 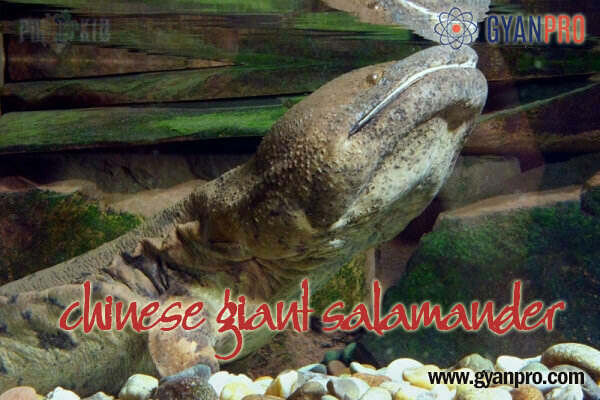 An adult Chinese giant salamander is 115 cm long and weighs up to 50 kg. It has a really large head with small eyes. The skin is generally dark brown and wrinkly with mottled speckled pattern all over. Their skin produces a white sticky fluid which is used as a defender for repelling their predators. It does not have gills for breathing instead it breaths through its porous skin. The giant elongated body has two pairs of small legs. They have smaller snout and long tail which is quiet broad. They are nocturnal species. The Chinese salamanders are found in the mountain streams of China, specifically in tributaries of the Pearl, Yellow and Yangtze rivers. The Chinese salamanders have very low metabolism which makes them go without food for like weeks together. They are not so specific about their prey. It usually grabs everything in its habitat. The prey can range from small fishes to invertebrates like crabs also. The main factor for breeding is the temperature, the ideal temperature of water for Chinese giant salamanders to breed is 26°C. The breeding usually happens in between July and September. The female lays around 400 to 500 eggs at a time. The eggs hatch only after 50 to 60 days and till the eggs hatch the male safeguards the eggs. The larvae is 3cm in length and attains maturity at an age of 5 to 6 years. Over human exploitation is one of the main reasons threat. Habitat destruction, pollution of the habitat water and commercial farming also poses a main threat for these species. People in around their habitat consume this animal as delicacy. Chemical fertilizers and local pesticides makes it difficult for these animals to survive. Dugong the Sea Cow The Amazon River Dolphin That Cannot Swim 6000+ Years Old Ancestor’s Tomb: DOLMEN Why is the Tower of Pisa Leaning?